Hey Guys! I’m soooo excited about today’s post! Change of season means that we naturally change what we eat. Intake of the hot drinks is on the raise (I’ve had 15 cups of tea yesterday! 15!!!) and will continue to be for the next few months, and there is nothing more comforting at this time of the year than a bowl of delicious, homemade soup. Am I right? And who doesn’t like this magic of warm, cosy, comfy feeling inside, which you get once you have put your fluffy socks on, snuggled under the softest and warmest blanket with your favourite magazine/ TV program/ or a book? Everyone loves it! 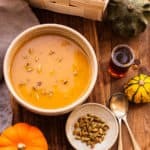 Even if you are a Summer child, there is no way you will not enjoy these moments, especially if you have a bowl of spicy, roasted pumpkin soup to go along with it! Another word for that warm, cosy feeling, which by the way, if you treat yourself to this roasted pumpkin soup, you will definitely get, is ‘hygge‘ (pronounced hue-guh). Which, if you are from Denmark, you will be familiar with ( or that’s what I’ve been told). In addition to the feeling, there is a whole well being philosophy behind hygge. And autumn and winter are the high seasons of it! Hence my today’s recipe…Beautiful, seasonal pumpkin (you can use butternut squash instead of pumpkin, and it will work great too!) with warming spices and herbs. In this recipe, we are using roasted pumpkin, because I believe that roasting veggies first, brings more flavour in them. However, you can also use fresh pumpkin, and just cook it all together in vegetable stock until veggies are soft, and then blend them all. 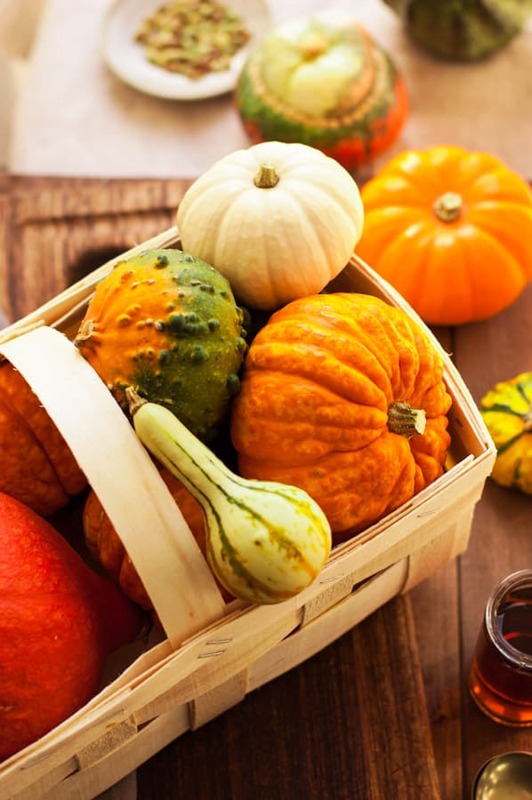 To roast your pumpkin, after cutting it into desired shape, place it in the oven heated to 200 C for about 40 minutes. Also, remember about pumpkin seeds! 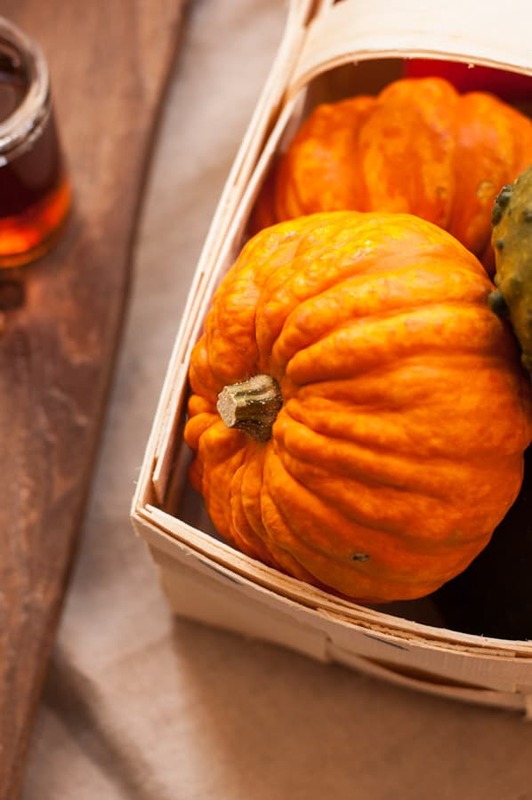 Do not dispose them, while cleaning the pumpkin, because they are super tasty and packed with nutrients! Toast them for about 30 secs in a really hot pan before sprinkling them on top of soup. 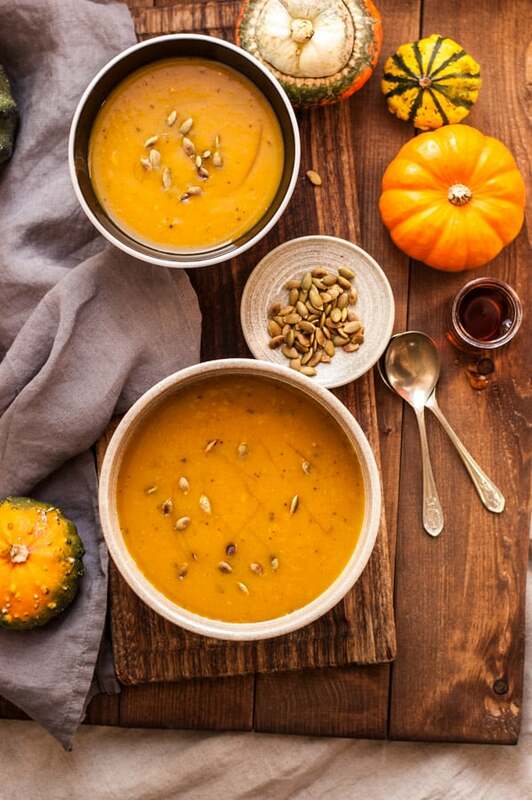 Almost for sure, just cooking and preparing this pumpkin soup feels like a seasonal ritual, and there is something truly magical and special about these moments. And I’m sooo looking forward to more of them in upcoming months! So go on, treat yourself to some hygge and giant bowl of soup and feel great for it! 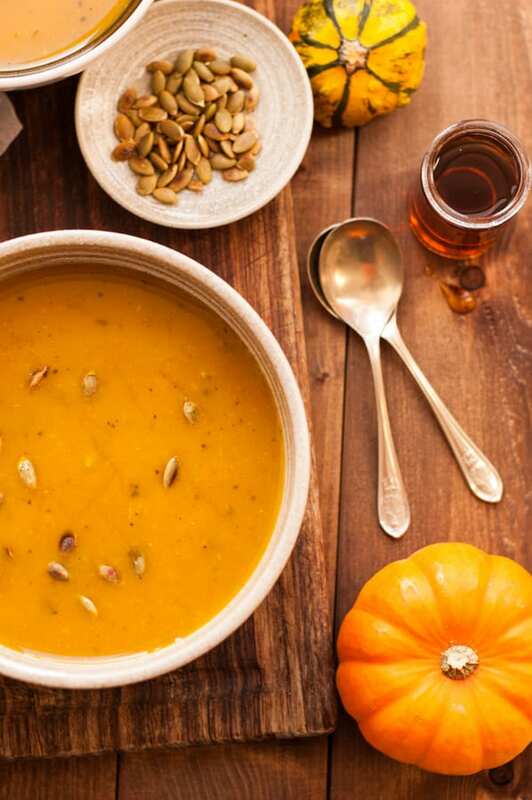 Delicious, full of flavour roasted pumpkin soup recipe. Soft, creamy and velvety bowl of goodness, sprinkled with toasted pumpkin seeds and drizzled with maple syrup. In a large, heavy- bottomed pan, heat the oil and add onion with pinch of salt, and cook on a low heat for few minutes, until soft. Add roasted pumpkin and vegetable stock and all the seasoning. Simmer for about 40 minutes or until pumpkin is soft, take off the heat and set aside. Set aside some of the liquid, then blend the remaining pumpkin until smooth and velvety, adding liquid back into the pan bit by bit as you go (add more liquid if you like it thinner). Strain through a fine sieve and set aside. 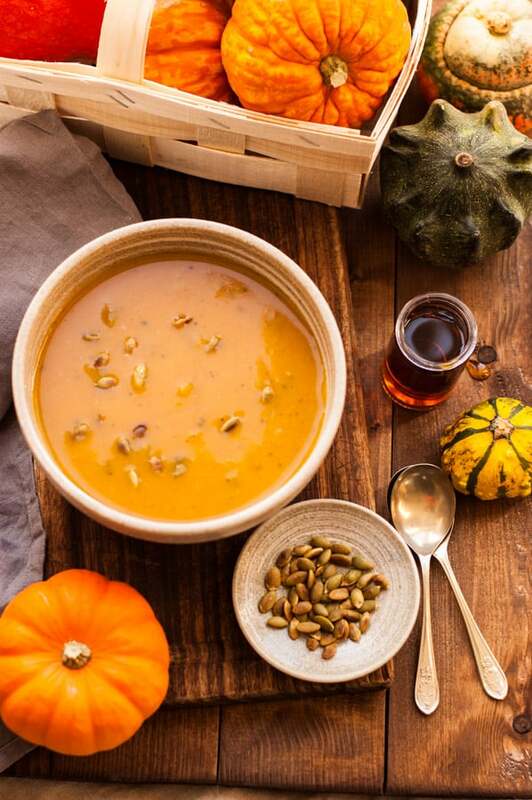 Serve soup with sprinkled pumpkin seeds and drizzle of maple syrup. Especially love that you added cinnamon to the soup, next time I’ll try it that way too. Pinned, of course!